Beau Soleil finds herself a man that loves the way that she looks and beyond, so if being plus size is not the problem in getting dates --- why did it end? A few months back I dated this amazing guy. He is smart, talented and puts a lot of effort into seeing me. I would have to say, he was the best guy I have dated for 2013. It didn’t blossom into a relationship, but we did exclusively see each other. Let’s call him “Jarrod”. Dating has nothing to do with how one looks like physically. For me, going out with someone is more of like developing a special connection only the two of you can understand. I’ve had my fair shares of being that insecure girl whom I thought won’t be able to date anyone because I actually thought my being plus size may be a hindrance. But I believe that it actually paved way into meeting amazing men who are not into the superficial things --- example: Jarrod. And for the time that he and I dated, I can honestly say that everything was real and there was a genuine connection. Every time we went out, time would just fly by. We just jived amazingly to the point that it can be a little scary (in a good way). But in the end we just had different views on how to proceed so it had to end. Sad but true. So, you see, ultimately a relationship lasts for the connection and not for the looks. Because looks, we can change, but the direction on where it takes, it should always be a one direction thing --- and that is love by the looks of it. Elevate a basic outfit with a splash of print. This printed Erzullie Holiday 2011 satin outerwear is perfect to liven up the basic foundation of the outfit --- Erzullie Resort 2012 gray long back top and jeans. The satin aspect of the outerwear also softens the otherwise hard look of the biker jacket, giving a balanced contrast for the ensemble. So what are you waiting for? 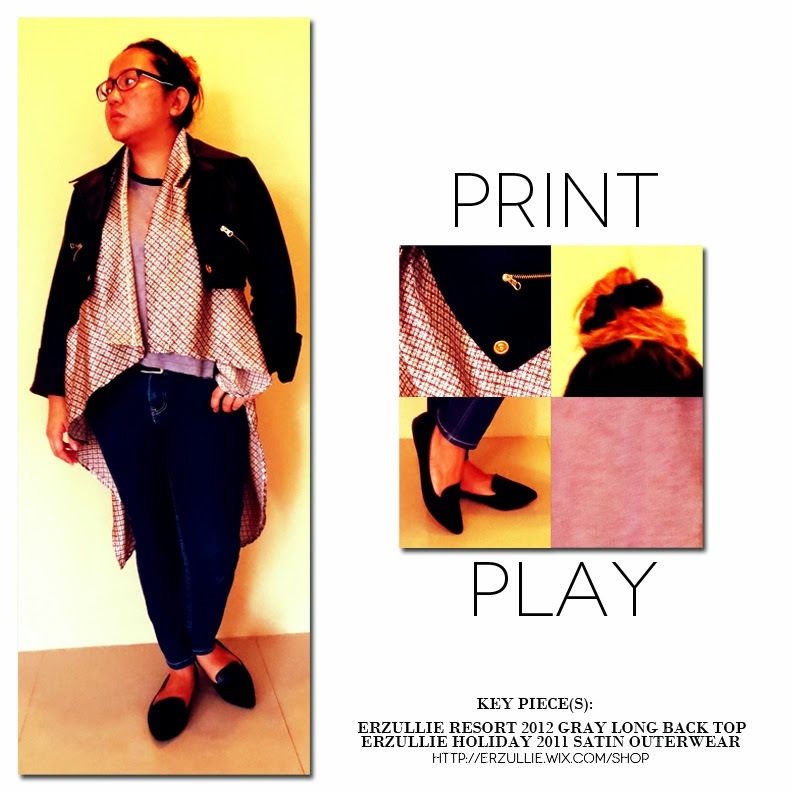 Do some “print play” for your fierce outfit, today! Love month brings LOVE QUESTIONS. So let’s have some fun, ladies! 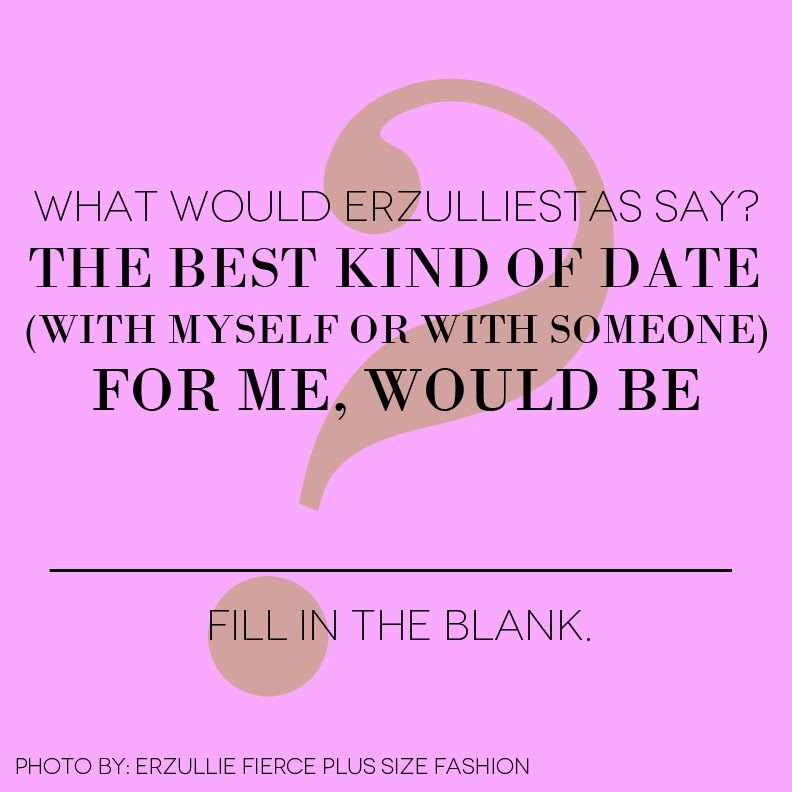 Fill In The Blank: The best kind of date (with myself or with a lover) for me would be ___. Join our Facebook page for the conversation! So what do we do, after all the damages are done? How do we survive that moment that we wish we could have handled differently? This question haunted me last night. It saddened me, knowing that I can’t take it back. But that is the point --- we can’t take it back. What we can do though is divert the results of those actions to better things. Like turning those mistakes into wisdom that we shall carry on to the future as we deal with life once again. Because life doesn't stop for anyone and we deserve to live it. In my case, I should have been more polite and mature in dealing with things that is obviously trivial. Feeling vindicated is not an excuse to lose my mind and composure any given moment. And although in my book, I have handled it better than before, I wish that I could have been more loving than what I did. I slipped at some points, but in the good side, I was better than before. So to my dear sisters in fashion, take comfort in the fact that we have all done things that we are not proud of. 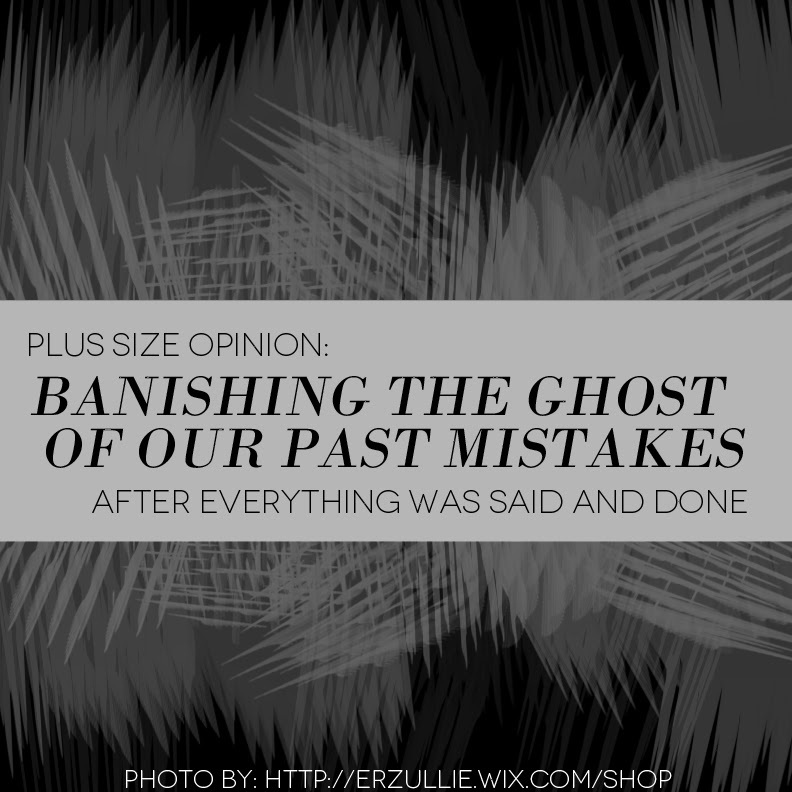 But what we can take pride in is how we banish those ghosts of our past mistakes by seeing how we became better from it. These ghosts will always pop in every now and then but it is to remind us of the lessons that we should be practicing in the present.